Bedrooms are supposed to be soothing sanctuaries – places where you can unwind and enjoy some much-needed rest at the end of a busy day. But it can be hard to calm your mind and drift off to sleep if you’re surrounded by clutter – and getting ready in the morning is much more stressful when you can’t find what you need. The answer? Built-in bedroom storage, of course! Although standalone wardrobes and chests of drawers may seem cheaper, commissioning fitted bedroom furniture is a worthwhile investment as it allows you to maximise storage by using every available bit of space. Made-to-measure units will sit flush against the wall, avoiding gaps around the back and sides, and you can extend them all the way up to the ceiling if you wish. 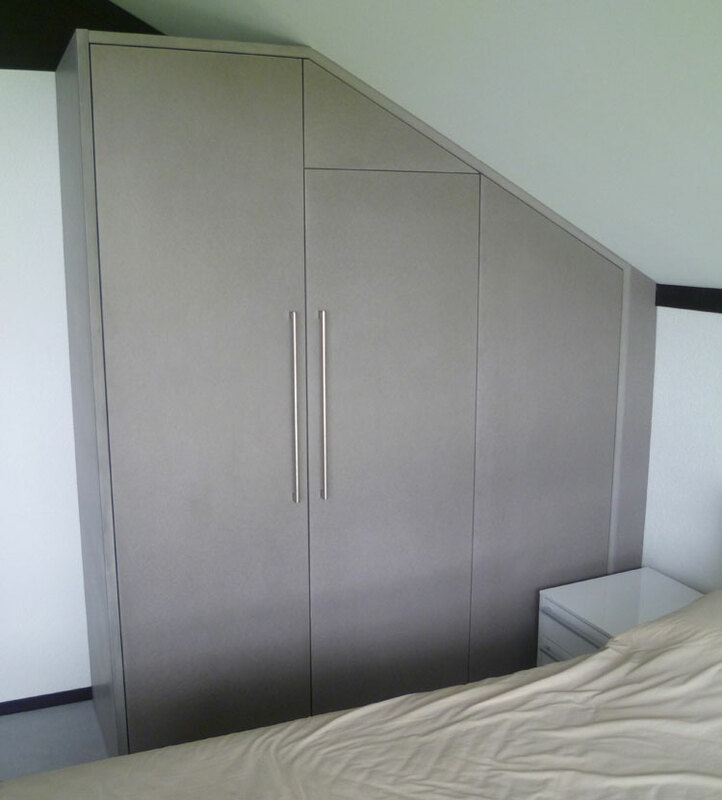 What’s more, bespoke furniture can be designed to fit all sorts of awkward spaces, even the tight angles and sloping ceilings often found in loft conversions and period properties. You could fill a long wall with a bank of built-in wardrobes, or create cupboards in alcoves, corners and recesses. 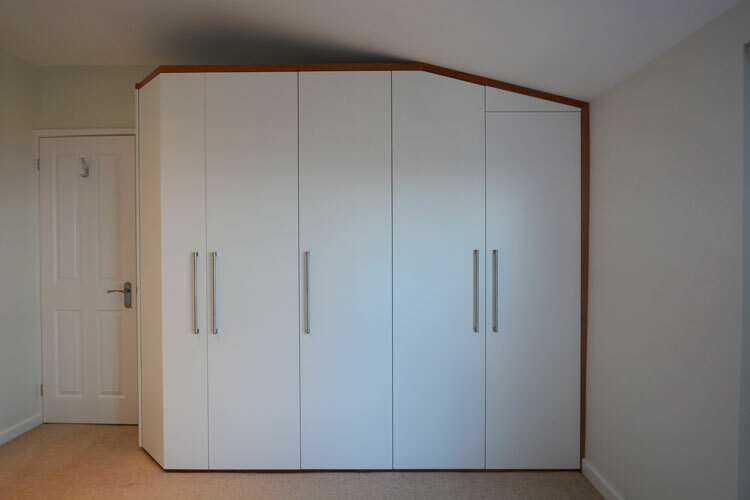 Here, a bank of wardrobes has been custom-built beneath a gently sloping ceiling. The angled end piece maximises cupboard space without getting in the way of the door to the left of the unit, and a contrasting cherrywood trim adds a striking finish. There are also endless options when it comes to the style of your custom-made bedroom furniture. You could choose a sleek and contemporary finish, perhaps with glossy doors or push-mechanism openings, or opt for a more traditional shaker-style look; you could even make a statement by adding a trim in a contrasting colour or material. If floor space is limited, consider sliding doors, which remove the need to leave room for conventional doors to open outwards. These built-in wardrobes make the most of the wall space between two doors. Shaker-style details create a look that’s understated yet traditional, in keeping with the age and style of the Bristol property. 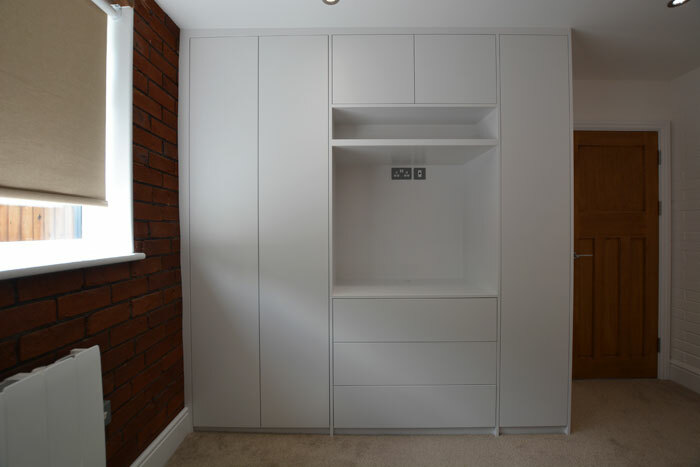 Bespoke built-in wardrobes and cupboards allow you to tailor the internal set-up to your needs, too. If you have long dresses or suits, make sure you include a hanging rail high enough to allow them to fall full-length without creasing; if you’re mostly hanging tops and shirts, you could put one rail above another to maximise space. Other options include internal draws and shelves, pull-out shoe racks and small compartments for socks, ties and jewellery. You could also incorporate space for a TV, perhaps behind the doors so that the reflective screen and flickering lights can be shut away when you want to sleep. This built-in unit combines wardrobes, drawers, space for a TV and a shelf for a set-top box. The design extends all the way to the ceiling, creating as much storage as possible for the homeowner. Of course, bedroom storage needn’t be limited to wardrobes and cupboards. One popular option is to make the most of bay windows or the recesses beneath dormers by adding a built-in window seat, either with a cupboard underneath or space below a lift-up lid. It’s a great way to create additional storage in otherwise-unused areas, and it provides a comfy spot where you can curl up with a book and a cup of tea. Or, for a modern alternative to traditional wardrobes, how about a built-in headboard with shelving or hanging space hidden behind? This not only creates a striking focal point, it also avoids taking up wall space which could be used for other things. Here, made-to-measure storage has been created in an awkward corner beneath the eaves. The whole unit is made from grey valchromat for an eye-catching, contemporary look. 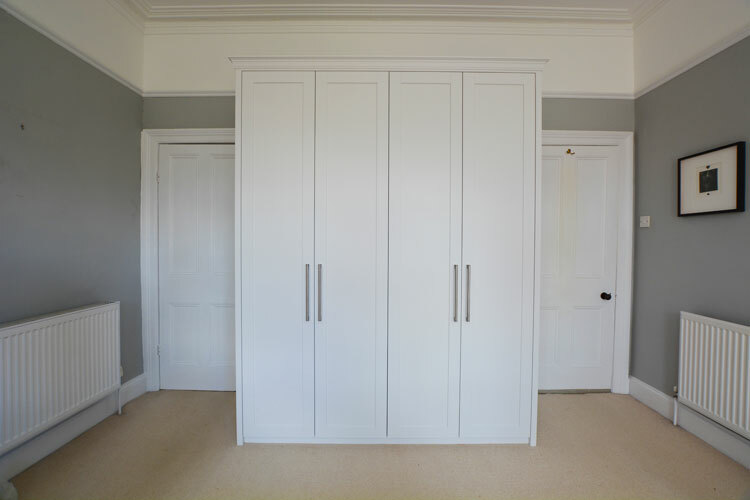 If you want to explore options for fitted bedroom furniture in your home, contact us to arrange an initial design visit. We’ll work with you to design bespoke storage solutions that suit your home and lifestyle, so that you can start and end each day in a relaxing, organised space that works for you.